Darsi Foss has been named Division Administrator for the Environmental Management (EM) Division. Along with the Remediation and Redevelopment (RR) Program, the EM Division also consists of the Air Management, Drinking Water and Groundwater, Office of Great Waters, Waste and Materials Management and the Water Quality programs. Foss has been at the helm of the RR Program since 2014 and served as the Program’s Brownfields and Outreach Section Chief from 1998 to 2014. Foss leaves the RR Program well-positioned to meet the demands and challenges in the months ahead as it not only oversees cleanup and redevelopment efforts around the state, but as the Program works through revisions to the NR 700-799 rules and issues regarding emerging chemical contamination, including PFAS. Darsi starts her new position as part of the DNR management team on February 17. 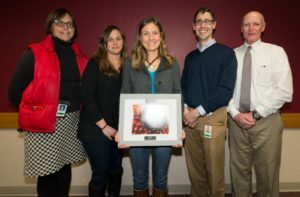 Congratulations to the Remediation and Redevelopment (RR) staff and teams that were recognized with achievement awards during the Wisconsin DNR’s Environmental Management Division’s 3rd Annual Awards ceremony, held in January. Nancy Ryan, Project Manager, Southeast Region (see photo). Remediation and Redevelopment Program Employee of the Year. Sonya Rowe, IT Project Coordinator, Central Office (see photo). Environmental Management Division Employee of the Year. John Robinson (retired), Northern Region RR Team Supervisor (see photo). EM Division Supervisor of the Year. The RR Program staff and teams were recognized for superior achievements and contributions to the RR Program, the Division and to the Agency. Applications are currently being sought for entry and senior-level Hydrogeologists for multiple positions around the state within the Remediation and Redevelopment Program. The deadline to apply for these positions is August 7, 2017. Click here to view the announcements. Vacancies are being filled in a number of locations, and the Program anticipates additional openings in the next several months. The agency intends to use this recruitment to fill those vacancies. The Remediation and Redevelopment Program would like to congratulation our staff who received the DNR’s 2016 Environmental Management Division Awards. Each award winner brings unique qualities, knowledge, and passion to their work. We are honored to have these outstanding people – and all our staff members – on the Remediation and Redevelopment team. 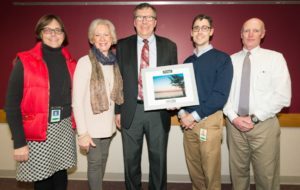 Recent RR transfer Bill Fitzpatrick was also recognized as the Employee of the Year in the Office of the Great Lakes for his work in that program prior to joining Remediation and Redevelopment. South Central Region Team Supervisor: Steve L. Martin. Steve is a trained hydrogeologist and has spent most of his 25-plus years working in the private sector. Steve has worked on a wide variety of contaminants across many regulatory programs such as CERCLA, RCRA and NR 700 and has extensive experience as a project manager and supervising teams of hydrogeologists. He’s been with the Department of Agriculture, Trade and Consumer Protection for the last four years, working on remediating sites affected by agricultural chemicals. Steve started with the agency on May 15 and is located in the South Central Region headquarters in Fitchburg. Angela is the engineering technical advisor for all RR program projects. She is responsible for providing assistance with planning, coordinating and evaluating engineering aspects of projects within the RR Program including evaluating alternatives for site remediation, particularly the design and construction/implementation of remedial actions, including untried, new and innovative remedial action technologies. She will also evaluate response action performance at state lead projects and conduct periodic optimization evaluations. Angela will serve as an expert for PCB/TSCA cleanups, hazardous waste requirements at cleanup sites, and RCRA Corrective Actions. She will also assist with sites in the Superfund and Superfund Alternative program. Angela’s first day with the Program was April 17. Rick started in the RR Program’s Green Bay Office in 2015 as a hydrogeologist and back-up regional spills coordinator. For the last year he’s been acting as the Regional Spills Coordinator while maintaining his responsibilities as a project manager. Rick has worked in the environmental consulting industry for the past 14 years and has been involved with projects in the agriculture, commercial, industrial, government, and solid waste practice areas. Rick’s new position was effective as of May 15. Pat has 38 years of experience, the last 26 of which has been as a project manager in the RR Program, with three of those years as the backup spills coordinator for the region. Pat has a BS in Soil Science, as well as post-graduate coursework in hydrogeology. In addition, Pat is a Professional Soil Scientist and a Certified Soil Tester, registered in Wisconsin. Pat’s new position was effective as of May 15. 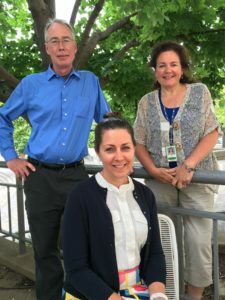 After nearly 27 years, the Remediation and Redevelopment Program says goodbye to its SCR Team Supervisor, Linda Hanefeld. Linda began her career as an LTE in 1981 in Fitchburg (now the SCR office and then called the Southern District) in the Wastewater Landspreading Program. In 1984, Linda again held an LTE position in the Fitchburg office in the Solid and Hazardous Waste Program, completing preliminary site assessments for the Superfund program. 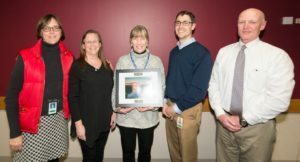 Linda was hired permanently in 1990 in the Wisconsin Rapids office, first as a Landspreading Specialist and Laboratory Certification Inspector, then for about 9 months in the Solid and Hazardous Waste program working on petroleum tank clean-up sites. In September of 1991, Linda transferred to the regional office in SCR as a Solid and Hazardous Waste Inspector for Dane County. In 1999, Linda transferred to the RR Program as a Hydrogeologist in the Dodgeville office for nearly 6 years, then transferred to SCR. Linda served on the program’s Land Recycling team, using her excellent customer service and communication skills to help promote the redevelopment of brownfields properties. She was promoted to RR Team Supervisor in October 2010. Linda wishes her co-workers well and plans to immediately sleep late and vacation. Linda’s last day with the DNR will be February 3, 2017.